Exterior composite siding is made from sawdust or wood chip fibers mixed with glue and bonded together using heat and high pressure. Some composite boards are formed with the addition of Portland cement to help ward off termite infestation. Composite siding is designed to last much longer than standard wood planks. When installed and maintained properly, they offer complete protection from the elements. Repairing or replacing damaged composite siding yourself can save hundreds in contractor fees and prevent damage to the interior of your home. Remove any damaged composite planks by using a flat pry bar to loosen the nails that are holding them to the outside wall. If the siding board is missing, simply cut the nails using a hacksaw. Measure and cut the new board the needed width. Allow ¼ of an inch for clearance between the new and adjoining composite siding boards. Push the new composite board upwards into position. Lower it evenly across 3/8 of an inch and secure with a nail on each side, at the top. Hold a small length of two by four under the bottom of the new siding plank. Hit the two by four with a hammer in an upwards motion to drive the board up into position. This will flush the plank to the adjoining ones without causing damage to the composite siding. The nails will be hidden beneath the layer of siding above. Brush on a mixture of baking soda and water if the newer paint needs to match a slightly older, faded color. Use a screwdriver and a small whisk broom to clean any loose debris from holes in the composite siding board. Carefully remove any small pieces from the hole. Fill smaller holes with filling compound using a small putty knife. Filling compound can be purchased at stores such as Lowe's or Wal-Mart. Larger holes and area damage will require adding multiple layers of filler compound. Follow label instructions and allow adequate drying time between the layers. Sand filled area with a medium to fine grade sandpaper after it is completely dry. 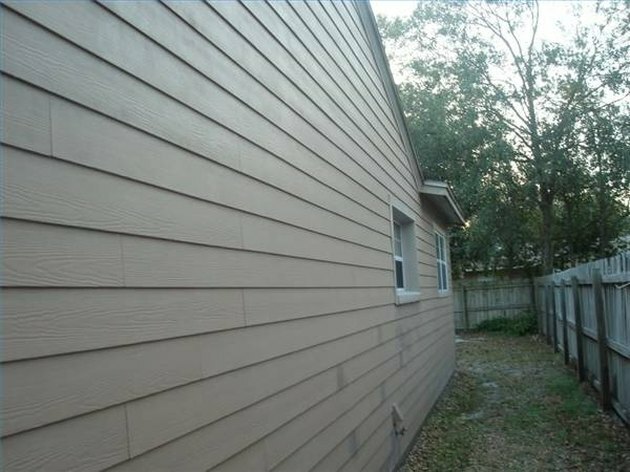 Paint or finish the repaired area to match the surrounding siding as close as possible.